Below you find the documentation for whosthat. The icons on the left allow you to import and export / share images, and set the preferences of the app. The middle section displays the selected person if a person is selected. It also allows you to edit the name of the selected person. With the right section, you set the position and size of the legend. Import images from your Photo Gallery, your iCloud Drive, or your Dropbox account. You can also close the opened image. Export the image with the legend. This can be by saving it in your Photo Gallery, or by sharing it on Facebook, Google+ or any other installed extension on your device. You can also print the image if you want to. The exported image is the size of the original image plus the legend added to it. This opens a popover with the preferences. This is explained below. This brings you to this page, the on-line documentation of the app. This is only available when a person is selected. It shows a popover with a list of people to select from. Selecting a person in the list will set the name to the selected person to this name. You can add, edit and remove people from the list, to reuse later. 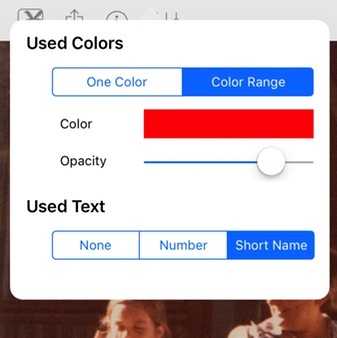 In the preferences, you decide how to color and display info in the legend. The people are selected by a colored circle. This can be the same color for all the people, or a color range. The color range is set automatically over the complete color range (red, orange, green, blue ...). If you want to use just one color, click on the color box to open a color picker. The colored circles are drawn over a grayscale version of your picture. You can set the opacity of the colored circles. The short name is automatically calculated, with a maximum of 3 characters. For example, Bruce Wayne will be BW.